I’ve been riding bikes on dirt for more than three decades, with only a few more years until I can say “four”–I had to learn to walk first! I was riding “gravel grinders” with cousins on mountain roads for summer fun, complete with a banana seat and cut off jean shorts. If we consider what we all would call a mountain bike, then I’ll say that I have more than two decades of mountain biking under my belt. Now that the qualifiers are out of the way … oh wait … they’re not. I’ve been an on-and-off again IMBA member over the years. I get it when we talk about “sustainable” trails. Having just written that, the three Cs built some really nice sustainable trails too. Ok. I think I’ve … no wait. Not yet. Yes, I sure do like a good, fast “flow” trail. I get into those swoopy turns and smile. It’s fun. Better yet, I like all kinds of trails. If I’m on my bike, on dirt, but not on the road, I am truly very happy. There, I’m good to say this now: Ride the Rocks, Dammit. 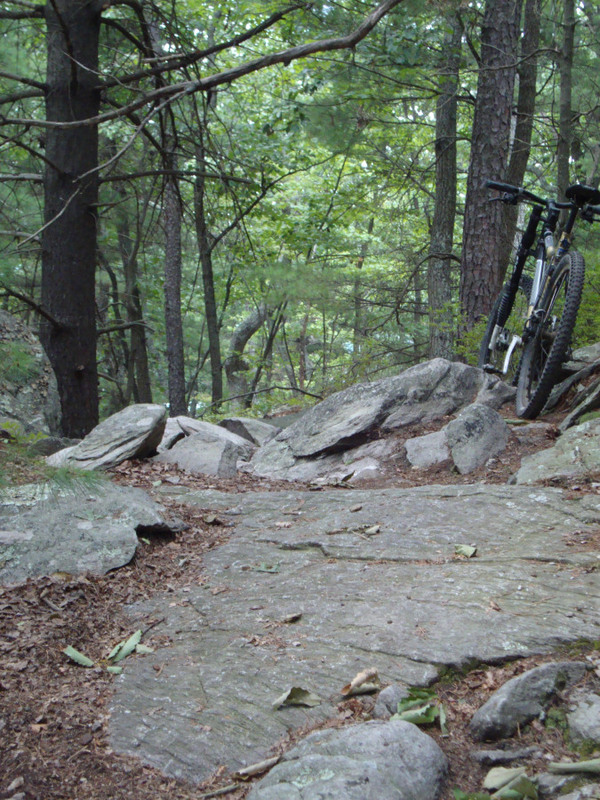 Can we please stop riding around the rocks, making trails wider and wider? Can we please leave rocks/small boulders/shark fins/turtle shells in the trails? Can we please stop piling up other rocks/trees/structures to make the rock garden a road-in-the-woods? If you can’t ride the rocks, get off and walk your bike. There is zero shame in that. One of these days, you’ll come to that tech-gnar and give it a go, and when you “clean” it you’ll be a better rider for it. Imagine the satisfaction you’ll feel. Next thing you know, you’ll be looking for a trail that is more technical. You bought all of that suspension, so use it. You wanted those big fat tires, so put ’em to use. A scratch in your bike’s paint job isn’t a big deal, especially for those of you that buy bikes like I buy non-book holiday gifts for nieces and nephews: maybe once every couple/few years. More than anything, if there are sections of rocky trails that are too technical for you, don’t make them “easier” by taking it upon yourself to scratch out a way/new trail/wider trail to get around it. Don’t bring your muscled friends, nor your rock-removal tools, out to the trail. Let it be. Walk over the rocks, if need be, and then continue your ride. If you can’t do that, go ride the other trails. Previous Post More Season’s Greetings!